This article was first published on Alice. Silicon Valley works…for Silicon Valley. Perhaps Martin Luther King, Jr. said it best: “privileged groups seldom give up their privileges voluntarily,” which explains why no matter how many conversations we have around the fact that tech has little to no diversity, the statistics refuse to change. Asking venture capitalists and entrepreneurs who are achieving multi-billion dollar valuations to adjust their behaviors in the spirit of economic empowerment for all is a losing battle. The truth is, we have much to learn from Silicon Valley. They perfected the accelerator model, they know how to select and support unicorns, and there is a density of financial and intellectual capital that much of the world dreams of, particularly as it relates to technology. That isn’t to say we shouldn’t change what doesn’t work for the rest of us, because it is increasingly apparent that the efficiencies of this Silicon Valley model don’t transfer into the Appalachian or Andean valleys, or even to pockets of nearby San Francisco, for that matter. Until we have every corner of the planet playing a role in global innovation, we can’t expect to solve the problems that impact those regions. We can swipe right for the love of our lives, order Lebanese food to our doorstep at 3am on a Tuesday, and pretend we’re kitesurfing with a headset in our living room. There is no reason innovators working toward clean water, renewable energy and a cure for cancer shouldn’t be receiving the support they deserve. Traditionally, money and knowledge have circulated among a privileged few, and here’s where I’m going to call out investors (many of whom are dear friends, and many of whom are women or minorities themselves): you must stop limiting your investments to the people you know, because in doing so you are doing a disservice to the world. It pains me every time I hear an investor talk about how they have so much deal flow from their network that they just don’t have time to look outside, how they could never invest outside of the Bay Area or New York because they don’t have the capacity to support companies elsewhere, or how they only take meetings through warm introductions. You are perpetuating the problem. Become part of the solution, because there is a big world out there that needs your resources, and we’re all better off when you deploy them objectively. Meanwhile, there are founders working in Detroit, Cleveland, Kansas City and sub-Saharan Africa on problems like waste management, education for all, and efficient transportation. Their worlds will likely never collide with the rich resources of the inner circle. The investors of Silicon Valley claim they are solving important problems, too. And they are. For that, I am grateful. But imagine if they collaborated with a new face of entrepreneurship? People who grew up near polluted waters, who had to make the hard decision to choose a day of school or a day’s wages, and who built the very roads we’re trying to make more efficient? 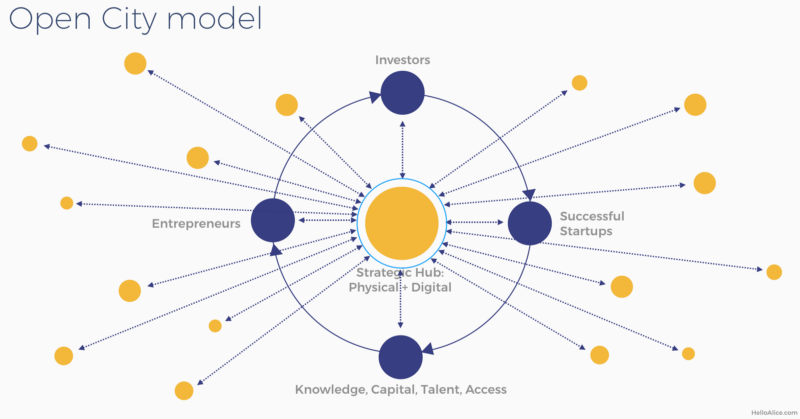 Enter the open innovation model (figure 1.2), where technology empowers everyone with equal access, and decisions are made based on merit, not pedigree. Where investors, mentors, community leaders, corporations and governments cast a global net to identify the best innovation to fulfill their needs. For entrepreneurs, this means being able to efficiently identify every contract opportunity, pitch competition, community and expert that might support their growth. For those who support entrepreneurs, it means scrapping the “who you know” model, and giving the Black veteran in Minnesota the same exposure offered to the Ivy League grad who grew up in Palo Alto. 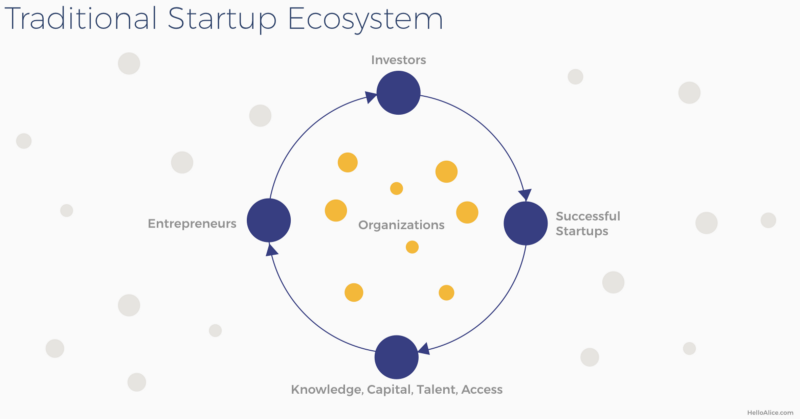 It encourages more efficiencies, which helps investors make more money, entrepreneurs build stronger companies, and ecosystem leaders serve the founders they are best able to support. Like any big problem, the complexities arise within the simplicity of the solution. There are lots of issues to work through, no doubt. This is what Team Alice is dedicated to, and what we invite you to join us in figuring out how to solve. It will make a difference for all of us, but it also requires a commitment from all of us. If you support startups, we’ll share our learnings via a monthly webinar on how to build inclusive entrepreneurial communities. If you’re an entrepreneur in need of support, sign up at HelloAlice.com where we’ll be implementing our learnings.